I normally ride with a Shoei Qwest full face helmet on high speed Interstate commutes. But for tight twisty back road rides I prefer the larger field of view afforded by an open face helmet. I always ride with earplugs so wind noise is not a consideration. But weight and light control are. I have been using an HJC FS-3 for a couple years and like it but I'd like to get something a bit lighter with an internal sun shield. I see models like this from Bell, Nolan and HJC. AGV has one with a moveable external sun shield. Cycle gear has one but that's a bit too cheap for me. Anyone use open face helmets too and have a model you really like? Here is my take on open-face helmets: NEVER! I have no desire to leave my face all over the pavement. In fact, while working as editor of a bike mag a few years back, I was approached to test the poser-esque Momo open-face helmet and told the sales manager at the magazine that there is no way I would do it, and was willing to lose my job over the matter. 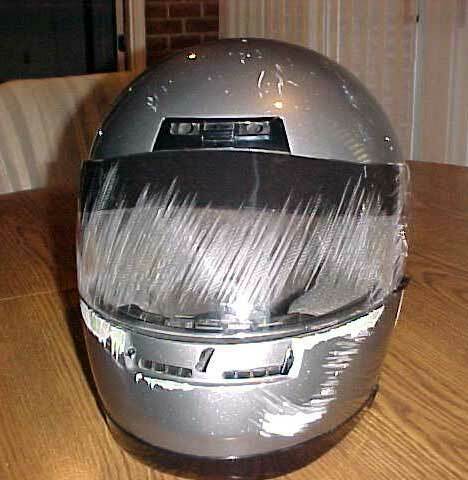 You don't cut corners on something as critical as helmet safety, and open-face helmets are just that. Kinda funny how the odds of crashing on high speed interstates is less than a 10th of crashing on twisty back roads. If weight and peripheral vision are the issues, shop around, there are some full-face helmets out there that will surely fit the bill without opening you up to skin donation..... FWIW, I don't wear so-called modular helmets (with front portion that opens up) for hte same reasons, can't see them staying together in the time of need (ie. violent collision with pavement). X4 on mikstr statements! That being said, I always liked the looks of the AGV dragon. I find the RF1100 to have a great FOV, and can be found on sale right now. X5 on mikstr opinion. I'm glad I learned this young at the BMX track and not now when its pavement and actually moving fast. Crank, have you considered a MX helmet ? Jaw protection, with the wider all around view you may be looking for. Not conventional I agree on a sports bike, but may be an option for you. You can remove the visor on most of them and its not that Uncommon in some area's that people use them a lot..
That being said I agree, there are a lot of full face helmets that I don't like because the part above my forhead blocks my vision, I tend to have to look up because of a previous spinal fracture (right between my shoulders) I have difficulty tilting my head so I don't always have full view of the road in front of me when riding hard. I have found that there are are helmets I don't have this problem with. Find a GOOD cycle shop (like a cycle gear if you have one close) and try on EVERYTHING they have. I promise you will find one that doesn't compromise your vision. that being said your helmet choice is your choice and I'm not going to bash you for it, but I don't have any experience with 3/4 or brain bucket helmets, I've always worn a full face, and I agree on modular helmets as well. I have a friend who was in a head on collision with a Harley that was in the wrong side of the road in a blind corner.. Harley guy survived my buddy died when the modular lock failed and his helmet came open and his face met the curb. I don't trust them one bit and talk everyone out of them I can. If you do go with the MX helmet make sure to get a good pair of goggles. I ran a MX helemt for a year on the road and had a few close calls with road debris. Don't cheap out, I've seen lenses fail in the dirt before, and I know they will on the street too. Occasionally, motorcycle magazines will review helmets, and it usually starts out something like this (clearly paraphrased). We're not even going to discuss half helmets or open face helmets. If you wear it for safety, wear a full face helmet. If you don't care about your safety, there's no point in reading our report. The details of this helmet are here. Last edited by FTL900; 02-10-2014 at 08:07 AM. As KCCO stated if you go with the MX helmet get good goggles. Durring my groups sunday funday ride this last weekend, we were riding some twisty airport roads when the guy in front of me found a nice patch of rocks in the road right as we both got into the throttle, needless to say he spun the rear tire and slung rocks back at me while we were going about 70mph so the rocks were going a lot faster than that and I was pelted big time, had I not been wearing a full face helmet I would have been eating those rocks or worse. Not to mention the bugs, birds, and other road debris the helmet has stopped from pelting my face. It's not just wrecks that can constitute the use of a full face helmet. ..or an Adventure helmet that comes with a built-in visor. Not impressed with Shoei face shields/visors. Quick Reply: Open face helmets?